The specified file public://inline-images/https_%2F%2Fs3-us-west-2.amazonaws_17.jpg could not be moved/copied because no file by that name exists. Please check that you supplied the correct filename. The specified file public://inline-images/https_%2F%2Fs3-us-west-2.amazonaws (1)_16.jpg could not be moved/copied because no file by that name exists. Please check that you supplied the correct filename. The current account deficit is likely poised to disappear thanks to the lira 's depreciation and a coming credit crunch (see @RobinBrooksIIF). But the system is still potentially very short fx liquidity. 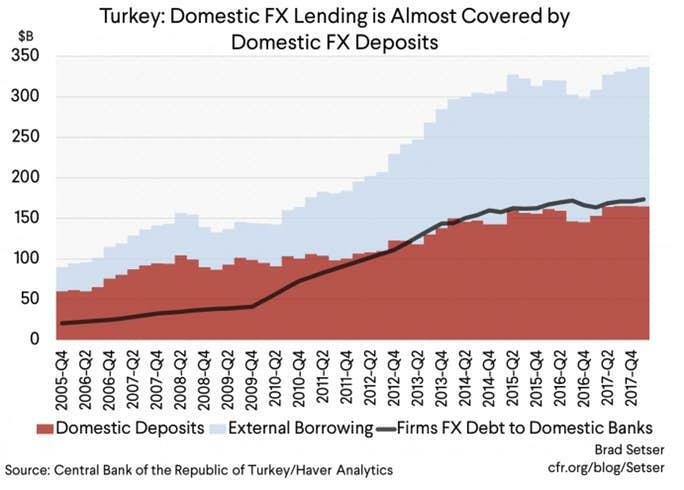 What makes Turkey unique and interesting, from a balance sheet point of view, is the recent ability of Turkey's banks to use fx funding to support rapid TRY loan growth. That is what makes Turkey a bit different from the 1997-98 Asian crisis cases. 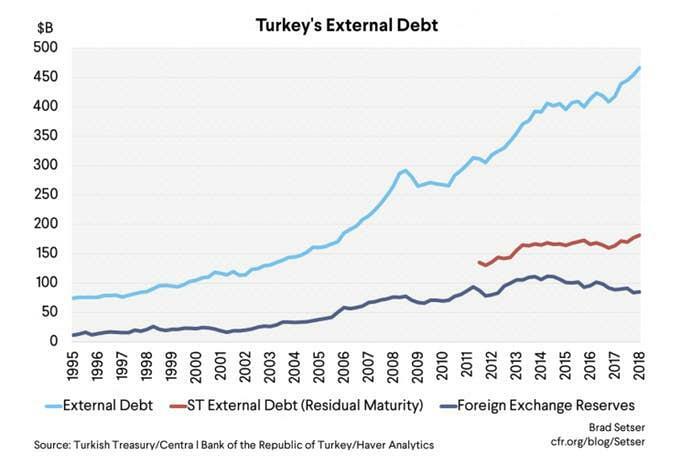 Turkey's banks account for almost 1/2 of Turkey's external debt, and about 2/3rds of Turkey's maturing STD. Setser commented "I find the balance sheet of Turkey's banks fascinating." The financial mystery in some sense isn't how the banks’ lent foreign currency to domestic firms, it is how they used their external foreign currency borrowing to support domestic lira lending. There is much more in Setser's post. For those interest in FX, It's worth a read in entirety. Setser concludes, and I agree, "I would bet that the dynamics in Turkey get worse before they get better—in most crises, creditors want to reduce their exposure, not just stop adding to it. The underlying risk of a severe crisis, one marked by systemic defaults not just an epic depreciation, remains." The story is an old one "complicated borrow short and lend long derivations eventually blow up, especially with foreign financing." On July 10, the Lira closed at 4.876. It is now 6.080. That a whopping 20% decline in just over a month, but it's nowhere near hyperinflation material. The primary bull case is not the one Robin Brooks suggested. Rather, it is a potential for a huge Lira rally if Turkey heeds Trump's demand and unconditionally releases US Christian pastor Andrew Brunson, absurdly held by Turkey on charges of terrorism.